Cleanup volunteers Diana Wiseman, left, of Egg Harbor Township, and Valerie Tedesco, of Mount Laurel, give the beach a close inspection for any trash or debris. Mornings marked by gray, cheerless skies and temperatures hovering in the 50s are not normally considered prime time for walks on the beach. But nearly 200 people braved the gloomy weather Saturday morning to venture out on Ocean City’s beaches from one end of the island to the other – from the Ocean City-Longport Bridge to Corson’s Inlet. Instead of toting around beach chairs and umbrellas, they carried large trash bags and were wearing rubber gloves. Now in its 33rd year, the city’s fall beach cleanup brings environmentally conscious volunteers together in a communitywide effort to remove litter from the sand and dunes. 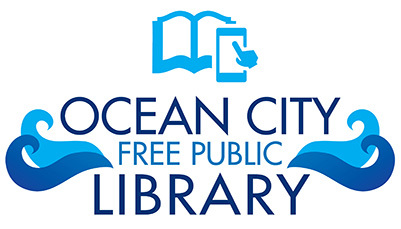 Charlotte Moyer, office supervisor for Ocean City’s Public Works Department and one of the organizers of the cleanup, noted that the beaches are the heart of the town’s tourism industry. She stressed the importance of keeping the beaches spotless for visitors and local residents, particularly during the summer vacation season. Volunteers filled up several trash bags with litter while cleaning up the beaches near the Ocean City Music Pier. Moyer said Saturday’s beach sweep had a strong turnout of about 150 to 200 volunteers, including students from the Ocean City and Egg Harbor Township high schools. 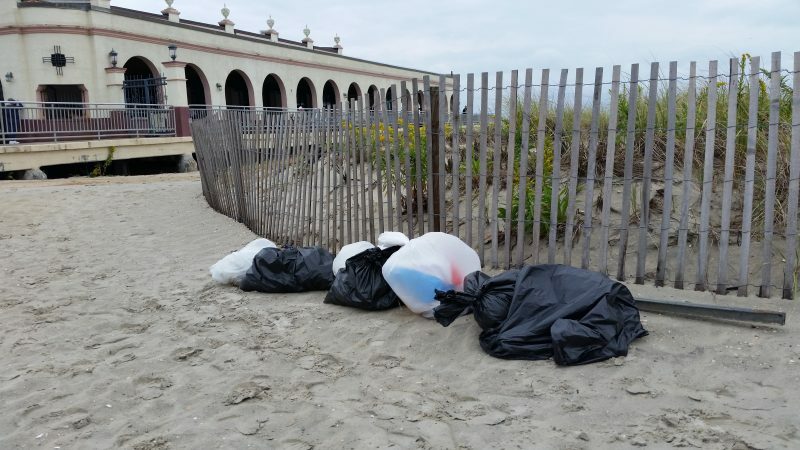 Ocean City joined with more than 60 communities along the Jersey Shore for the annual cleanup, which is supervised by the environmental group Clean Ocean Action and the New Jersey Clean Communities Council. Last year, 7,416 volunteers removed 373,686 pieces of debris on beaches statewide. 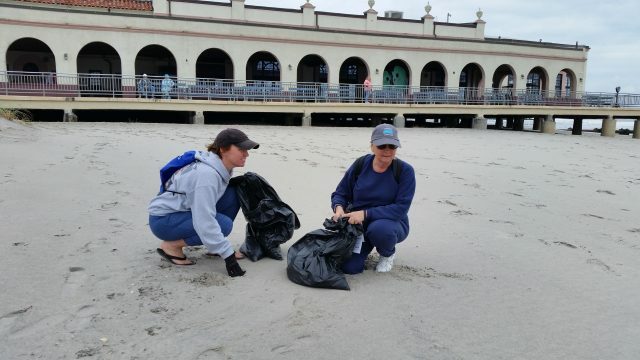 Participants in the cleanups collect and record valuable data about trash and debris, which is presented in annual reports and used to promote federal, state and local programs to reduce litter, according to Clean Ocean Action. 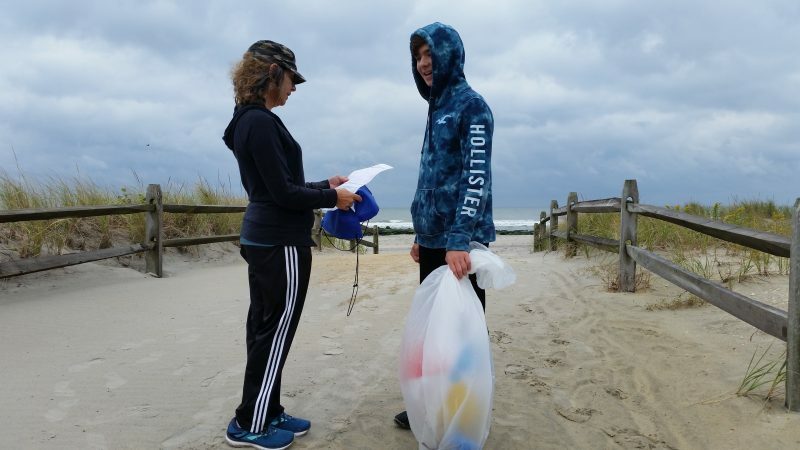 On Saturday morning, Ocean City resident Gloria Scarano and her 15-year-old son, Gabe Doughty, were using a checklist to keep track of all the litter they plucked off the beaches. 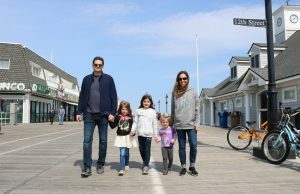 Scarano and her son are regular volunteers during the city’s annual beach sweeps in the fall and spring. Doughty, a sophomore at Ocean City High School, has a passion for protecting animals and the environment and hopes to become a veterinarian. Among the odd items that Scarano and her son found were a beach ball and a soccer ball. Ocean City resident Gloria Scarano and her 15-year-old son, Gabe Doughty, use a checklist to keep track of the trash they picked up. 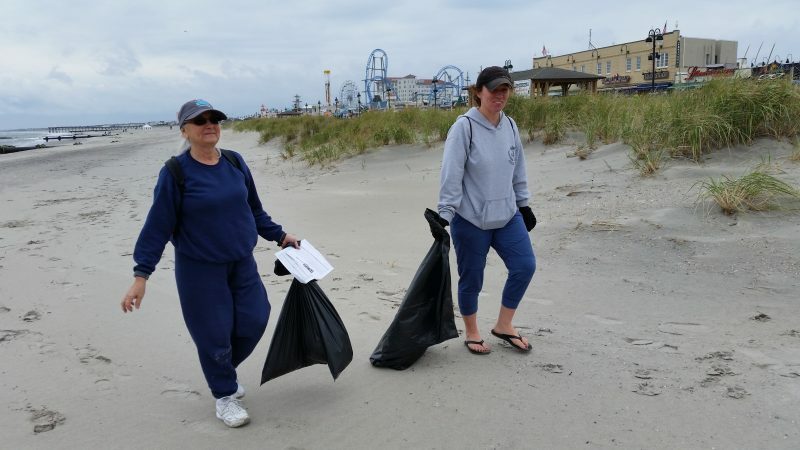 Three other cleanup volunteers, Diana Wiseman, Cindy Brumbaugh and Valerie Tedesco, all members of Coastal Christian Church in Ocean City, scoured the beach underneath the Boardwalk for trash. “It’s very, very dirty underneath the Boardwalk. There were lots of plastic spoons. 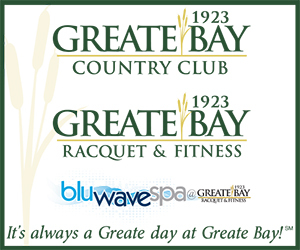 That’s where we found a lot of cups, too,” said Wiseman, a resident of Egg Harbor Township. “And straws, too,” added Brumbaugh, who lives in West Chester, Pa.
As Wiseman and Tedesco searched the beach near the Ocean City Music Pier for litter, they came upon a hunk of concrete partially buried in the sand. 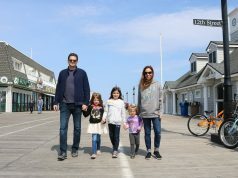 “No matter how many times you go over it, you always find something else,” said Tedesco, a Mount Laurel resident and summer homeowner in Ocean City. 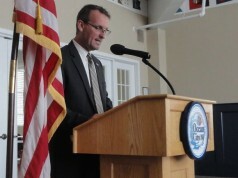 Wiseman noted that, ultimately, much of the trash ends up in the ocean unless it is removed. Along with Brumbaugh and Tedesco, she helped to fill up a few trash bags with litter. 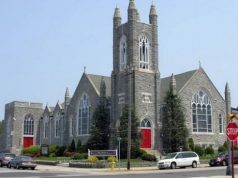 “Our church is here. This is where our community is. We want to keep it clean,” Wiseman said. Valerie Tedesco, left, and Diana Wiseman search the beach and dunes for trash.